This article first appeared in The Edge Financial Daily, on March 22, 2018. Vivid Sydney 2017 Lighting Of The Sails audio creatures. The Nautilus Forest — Design by Adrienn Lord for Mandylights. Vivid Art After Hours — Goldheist. The world’s largest festival of light, music and ideas, Vivid Sydney returns in 2018 with a spectacular new precinct at Luna Park — the return of much-loved Customs House — and a fantastical blend of everyday objects and Australian-inspired motifs on the sails of the Sydney Opera House. Vivid Sydney, celebrating its 10th anniversary this year from May 25 to June 16, will portray the Harbour City in the colour and spectacle of Vivid Light, take over Sydney stages with Vivid Music’s electric performances and collaborations, and provide a global forum for thought-provoking debates and creative discussions at Vivid Ideas. Information is available on vividsydney.com, but if you’re seeking a good time in this lovely city, these events might just be useful for you. For the first time, Vivid Sydney’s dazzling Light Walk extends to Luna Park Sydney, where the iconic amusement park comes alive with large-scale projections on the façade of Coney Island, an old-school funhouse. The show celebrates the history, magic, creativity, engineering, fantasy and imagination, all combined to create millions of memories on this unique and special site. This year also marks the first time Luna Park’s iconic Ferris Wheel will be lit for the festival following an LED refit — a massive boost in the number of lights adorning the wheel. 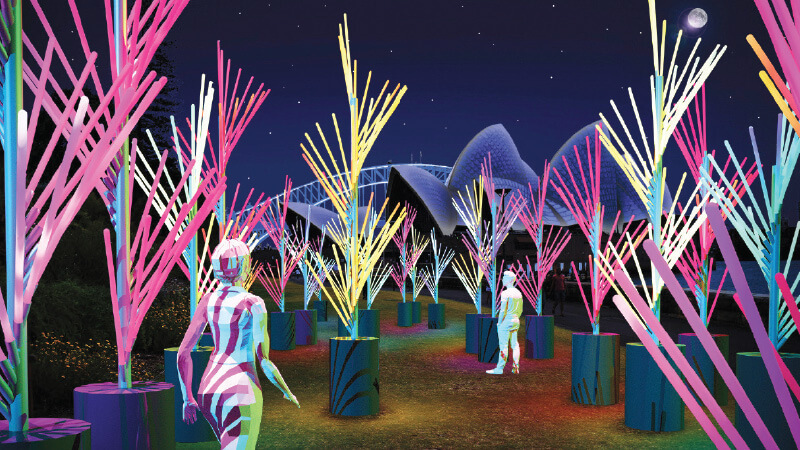 Vivid Sydney’s bright lights will illuminate the Royal Botanic Garden Sydney again in 2018, where visitors can go on a pathway weaving through an exciting nocturnal environment inspired by nature. Here, the Parrot Party inspired by New Zealand’s Kea parrot and Australia’s Rainbow Lorikeet, comes alive as people gather, breaking into songs while the surroundings radiate in colourful lighting. Aqueous will dazzle with its interactive landscape of meandering pathways of lights while visitors are engaged in a collaborative play. The Bloom, a giant electric, metallic flower with petals — adorned with mirrors that refract and reflect light — puts you in the centre of the flower, allowing you to capture the perfect photo moment. He’e nalu, meanwhile, offers the joyous sensation of surfing a wave. To celebrate their 100-year anniversary, May Gibbs’ iconic and immortal characters, Snugglepot and Cuddlepie and their stalwart companions come to life in projections on the façade of Customs House, as they journey through the Australian Bush and encounter the weird, the wonderful, and things quite unknown altogether. This whimsical piece will be narrated by renowned Australian film and television actress Noni Hazlehurst AM. All eyes turn to the World Heritage- listed Sydney Opera House at the centre of the Vivid Light Walk for Lighting of the Sails, created in 2018 by award-winning Australian artist Jonathan Zawada. Visitors will be captivated by Metamathemagical, a bold and dynamic display of morphing digital sculptures inspired by recognisable Australian motifs across science, nature and culture. Sydney’s other iconic buildings will once again be transformed as well, including the façade of the Museum of Contemporary Art Australia (MCA) with Virtual Vibration, a highly-collaborative creative work produced in conjunction with MCA Collection artist Jonny Niesche and composer Mark Pritchard. Interactive lighting display Skylark will let visitors put their own colourful mark on the city, from Sydney Harbour Bridge and the skyscrapers of Circular Quay to the reaches of Sydney Harbour. Network Ten and MasterChef Australia will bring a magical experience to the façade of the ASN Co building in The Rocks, in celebration of Masterchef and Vivid Sydney’s 10th birthday with a mystery gâteau. Mini construction-worker chefs will guide you on a journey of fun and wonderment, with the famous MasterChef clock ticking down to the final extraordinary surprise. Festival favourites from last year are back along with a whole new mob of fierce, fantastic, quirky and endearing species for Taronga Zoo’s Lights for the Wild. Visitors will discover new spectacular animal light sculptures, and learn how Taronga is working to help save 10 species from extinction over 10 years. An art-meets-technology water fountain, light and laser experience takes Darling Harbour visitors into a dream-like dive under the ocean, while projections ofBBC Earth and Sir David Attenborough’s Blue Planet II will be seen on the iconic rooftop of the Australian National Maritime Museum, exploring the fascinating world beneath the waves. A pop-up market inspired by the colourful neighbourhood street markets of Brazil, built from scaffold and recycled materials and lit by lasers, will transform the Chatswood CBD. The Concourse will take visitors on an immersive, deep dive into space featuring NASA’s amazing imagery and a 360-degree projection. Barangaroo glows under layers of light and sound evoking the surrounding waterways, with the precinct coming to life through the magnificent art of puppetry with a giant luminescent creature venturing along the waterfront in a theatrical display of sound and lights. Precinct contributor Coca-Cola returns to light up Sydney’s iconic Kings Cross and to support another KX program in 2018. The colourful strip along Darlinghurst Road will be transformed with a spectacular display of lights. The famous Coca-Cola sign comes alive again in 2018 in a creative colour show. Other Vivid KX transformations include the historic Victorian Terrace; World Bar, which will feature a multi-storey house party; and the renowned Kings Cross Hotel, which will host cutting-edge artists curated by legendary party crews. Vivid Music ups the ante in 2018 with a top-notch line-up, from noise to jazz, sonic experimentation to soul. Highlights include a one-night-only performance by Grammy award-winning rock goddess St Vincent, and the return of Curve Ball headlined by Alison Wonderland – a large-scale live music and art event created by the team behind Field Day, Harbourlife and Listen Out – both at Carriageworks. The City Recital Hall also returns, tracking the extraordinary rise of jazz with the Innovators In Jazz series featuring triple Grammy award-winner saxophonist Branford Marsalis. The world’s finest jazz vocalists including Kurt Elling and chanteuse Madeleine Peyroux, will perform alongside Orange is the New Black star Lea Delaria in her musical comedy and jazz interpretation show. 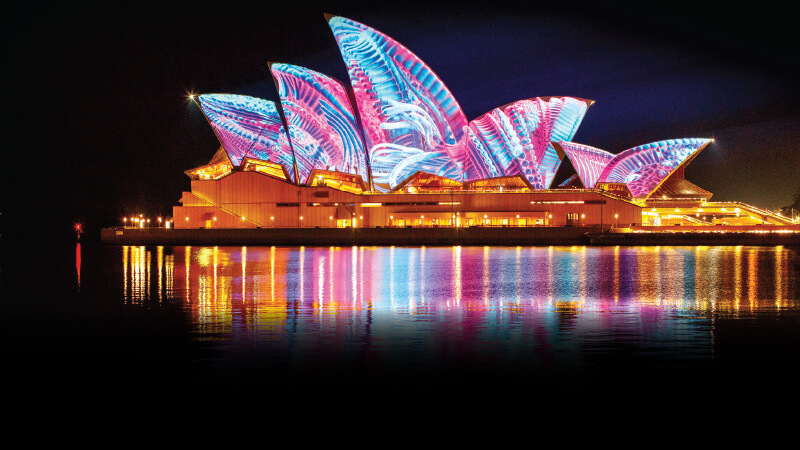 Vivid LIVE at the Sydney Opera House hosts a stellar line-up of Australian exclusives as part of Vivid Sydney, including several Opera House debuts. Highlights include American dream-pop icons Mazzy Star, the godfather of West Coast rap Ice Cube, acclaimed 90s indie rock singer/songwriter Cat Power, Grammy award-winning artist Solange, and the long-awaited collaboration between iconic Australian artists Daniel Johns and Luke Steele. Now in its 4th year as part of Vivid Sydney, Heaps Gay struts uptown to Sydney Town Hall for an unmissable experience — the inaugural Qween’s Ball. 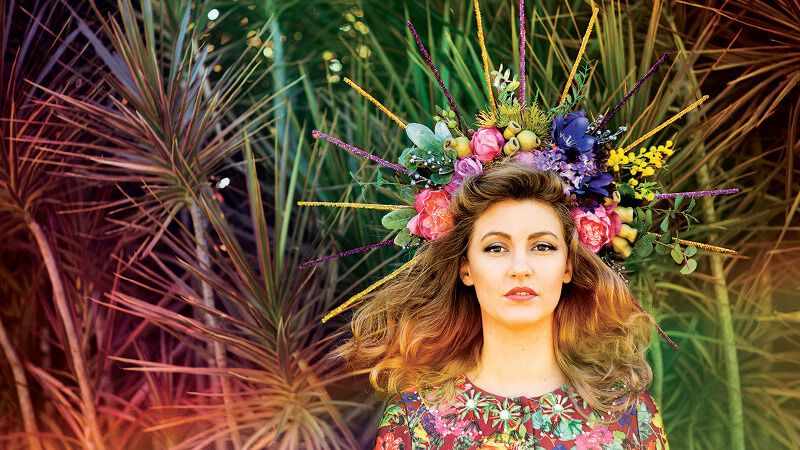 Other not-to-be-missed events include Young Hearts Run Free and one of Australia’s most exciting breakthrough artists performing at the Enmore Theatre, Vera Blue. Also returning to Vivid Music is X|Celerate, a partnership between Vivid Sydney and the City of Sydney to enliven music venues across town. Showcasing grassroots and emerging local music talent, highlights include Purple Sneakers 12th birthday at The Lansdowne, a fusion of food, wine and music at Cake Wines Cellar Door, and HAPPY and VISIONS at The Lady Hampshire. As architects of the future, it’s time to join the masterminds and creative catalysts at Vivid Ideas for inspiration. Vivid Ideas provides a forum to workshop, collaborate and cultivate fresh thinking to drive the creative agenda across technology, design, entertainment and culture. Vivid Ideas returns with some of the world’s greatest minds as we explore the future-shaping scenarios that will define our lives. Vivid Ideas 2018 showcases those who are leading the way in technology, creativity and science. Game Changers and Creative Catalysts this year include filmmaker, marine explorer and conservationist James Cameron. In a Vivid Sydney exclusive, James will explore his passion for science and technology, and how it has influenced his work as a film director and environmentalist. James will be joined in conversation by Adam Spencer, while in Sydney to open the James Cameron – Challenging the Deep exhibition at the Australian National Maritime Museum. Australian global success story Dare Jennings – founder of Mambo Clothing, Phantom Records and Deus ex Machina – joins his good friend James Valentine to discuss creating cult brands that cut across age and lifestyles as well the joys of throwing out the rule book. Futurist and game developer, Jane McGonigal can prove games have the power transform our real world lives. She and Artificial Intelligence expert Kriti Sharmajoin Vivid Ideas to explore the latest in AI, VR and gaming to ask what kind of society we can create with technology. Visual strategist at NASA’s Jet Propulsion Laboratory and co-founder of the Museum of Awe, Dan Goods joins the Vivid Ideas Creative Catalysts line-up to explore how creativity and science interplay and why NASA has a virtual strategist. The New Horizons series explores the mega-trends and micro-developments in technology and innovation, and shines a light on experts creatively tackling major issues. Topics include Future Fashion, Algae is the New Black, Blockchain Decoded and Evolving Democracy. Over three successive Wednesdays, Vivid Sydney will take over the Art Gallery of NSW to create an intimate portrait of our better selves. Our special guests dare to ask if we can improve dying, how we can find common ground when and where there’s conflict, and why we should nudge perceptions around female sexuality. These events will be accompanied by curated music from Goldheist, Air Land Sea and Haiku Hands. The Vivid Ideas Exchange at the Museum of Contemporary Art returns, boasting a diverse line-up of talks presented by creative experts covering topics including the future of work, the ethics of humanising technology and how to become agents for change.